The Future Tense in association with The Old Vic Tunnels is pleased to present the first major London solo show by Joseph Loughborough. This introspective, confessional corpus of work, developed over the last 12 months whilst living in selfimposed exile in Paris, speaks not only of mortal sins and desires, but also of fears and the acknowledgement of one's own absurdity. Working exclusively in charcoal and graphite, and at a much bolder scale, Loughborough has eschewed the vivid colour palettes seen in recent works in order to focus on the impulsive and expressive execution of line and form that has become his trademark. 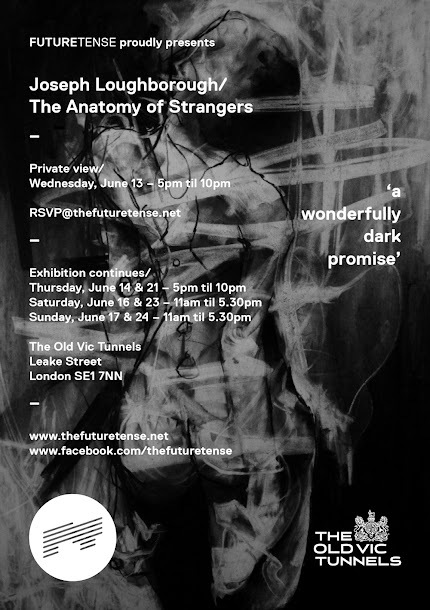 On Saturday 16 June from midday, the public will have a unique opportunity to watch the artist at work as he creates the final piece from The Anatomy of Strangers series in-situ at The Old Vic Tunnels. The Old Vic Tunnels provide the perfect backdrop for this intense and emotive exhibition, adding a foreboding sense of claustrophobia that perhaps echoes the artist’s own confrontation with the human condition.